Can we play a game of truth and dare? If you were to rate yourself on your level of belief that you CAN get pregnant and carry a healthy pregnancy, what would that grade be? Out of 100% – go ahead and give yourself a grade. When I put this question to most of my prospective clients, the answer I hear is rarely above 50%. So give yourself permission to answer honestly, and please be gentle with yourself. For the next 5 days, do these 7 Fertility Affirmations to Overcome Your Worst Fertility Fears and let us know how your belief score has changed! As one way of helping to increase your fertility faith “score,” I’ve put together a list of 7 fertility affirmations. And because I love to print my own affirmations on cue cards, I’ve designed them on a cue card-sized PDF that you can print out to carry around with you or keep handy on your desk or nightstand. You can repeat these affirmations first thing in the morning, last thing at night, or whenever you have two minutes throughout the day. You’ll be surprised at how quickly you’re able to change the way you feel about your chances of becoming a mother. Because if you’re reading this, I know that in your heart that’s what’s meant to be for you. 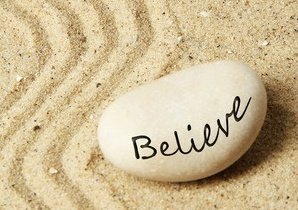 This is a little support from me to help you believe in your dream. Say them out loud or silently…. 1. Fear: I can’t carry a child. Fertility affirmation: My womb is warm. My heart is open. My body is ready to carry our baby now. 2. Fear: my body is working against me. Fertility affirmation: My body is powerful and healthy and works with me every day in every way. 3. Fear: my body is broken. Fertility affirmation: I value my beautiful, strong, and courageous body. Yes! 4. Fear: How will I manage having small kids at my age? Fertility affirmation: I am as young and energetic as I feel, and I open my arms to motherhood now. 5. Fear: My weight makes it harder for me to conceive. Fertility affirmation: I nourish my body with nutritious food and I open myself to greater health, strength and fertility now. 6. Fear: Unhealthy choices have permanently hurt my body and hormones. Fertility affirmation: I’m a healthy, active woman who fuels my body with nutritious meals and leads a healthy life now. 7. Fear: I waited too long to start trying. I should have made it a priority and now it might be too late. Fertility affirmation: My time for motherhood is now. I surrender to my body’s divine wisdom and pro-creative powers. YES! If you gave yourself a score of 50% or less on your belief that you CAN get pregnant and carry a healthy pregnancy, let us know in 5 days how your positivity level has changed!